today, curt and i preview the national league central division. check out our preview of the american league east, here. check out our preview of the american league central, here. check out our preview of the american league west, here. check out our preview of the national league east, here. The Brewers were my team last year, and they remain the best team in the division, even after losing Prince Fielder to free agency. They wont be as good as last year, but they'll still probablly win a weak division. The Reds are the only other team that could give them a run for their money. I actually like the Reds, but I think its a year too early. Latos is going to be huge for them and they are deep in the rotation. They have the best offensive player in the NL and a lot of good spare parts. The Reds need one more superstar bat and they're a WS favorite. A big year out of Chapman and Cueto and a couple of career years sprinkled in amongst the lineup and the Reds are a World Series team this year. The Cardinals wont be bad, but without Pujols and Carpenter, they wont be good. Some juicy O/Us in this division as well, take the over for Milwaukee at 81.5, take the under for St Louis at 87. Take the over for Houston at 62.5 if you dare. No team should be expected to lose 100 games. 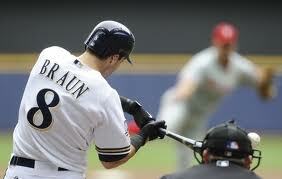 Even bad teams need bad breaks in order to accomplish that feat and the Astros arent all that bad. Actually, I think the Cubs are probablly a better bet to lose 100 games now that I really think about it. Scary. i think this will be the closest 3-team division race in 2012. i like the cardinals but the recent shoulder nerve issues with carpenter worry me especially in light of the fact that wainwright will be coming back from his own injury that had him miss the 2011 season. they traded former stud prospect colby rasmus last year for edwin jackson, who then took a 1-year deal with the nationals. with the loss of pujols, the declines expected from holliday, berkman and beltran, the team's three best players, i think this team won't be in a position to defend their title. if you could convince me that mat latos was a true ace, chapman could figure out a way to pitch 150 above-average innings (he'll start the year in the bullpen again), mesoraco and cozart were gonna be co-rookies of the year and joey votto would win mvp, i'd be happy to pick the reds as division winners. some of these things might very well happen, but most won't. the brewers lost prince fielder last year but replaced him with mat gamel and aramis ramirez. the dropoff won't be as much as you'd think. otherwise, their offense is pretty much the same as last year and their defense should improve slightly. the bullpen will be stronger with a full season of k-rod and the starting pitching should be even better as well, mostly due to the bad luck they had last year. gallardo, greinke and marcum are a top 4 rotation in the national league (along with the giants, phillies and nationals). *Curt was a guest on Episode 11 of the No Hyperbole Allowed podcast with Rich and Colin, which you can listen to here.